I hope my slapstick humor will appeal to you. Three pickles decide to escape from the deli to seek excitement and adventure in the outside world. 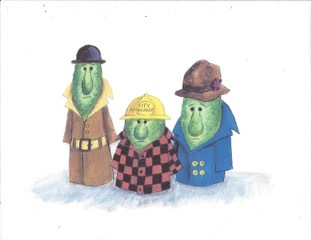 SLIM, FATS and LOUIE must hide their identify with disguises before they venture out in the big city. On their way to the circus, they face several near-disasters, but it is Louie’s triple flip that a causes chaos at an outdoor cafe. In the end, their misadventures make the runaways appreciate coming home to the deli…until the next adventure. Young children sometimes want to run away from home, thinking that life is more exciting in the “outside world.” I have written and illustrated several picture books. My 22-year career as a high school art and art history teacher was fertile ground from which I took many of my ideas for stories. As a member of SCBWI I have attended a number of conferences where agents and editors have favorably critiqued my work. I am including an illustration from the story. Thank you for considering my work. I look forward to hearing from you. Something strange was brewing in the pickle barrel during lunchtime at “Sam’s Famous Deli.” Dozens of pickles floated in the brine. Each waited to join a sandwich on a plate. However, three pimply pickles had other plans. No sandwiches for them today. Slim, Fats and Louie were plotting an escape.